Work is an activity, not a place. This is the primary concept behind agile working. Agile working is a way of working where organisations empower its people to work where, when and how they choose. It incorporates dimensions of time and more importantly, place flexibility. While agile working is not new, it is the new way of working. As such, it forces us to rethink the design of workspaces. Agile working involves creating a flexible and productive environment that allows for collaboration, innovation, and teamwork, while at the same time empowering people to make their own choices about how and where they work. Agile working requires having a wider range of locations for people to choose from in order to “get work done.” This means that today’s agile working environments require multiple settings for the different ways we work. So, an office full of rows of desks and chairs and nothing else will not work. Today’s employees need variety to support the work they are doing. Providing your workforce with the freedom to make individual choices spurs creativity and intuitiveness, helps generate fresh ideas and improves productivity and communication across different departments. Companies such as Apple and Google which fosters an agile working environment, show us that the right office interior design can attract the right talent and ultimately bring positive, measurable results to your business. 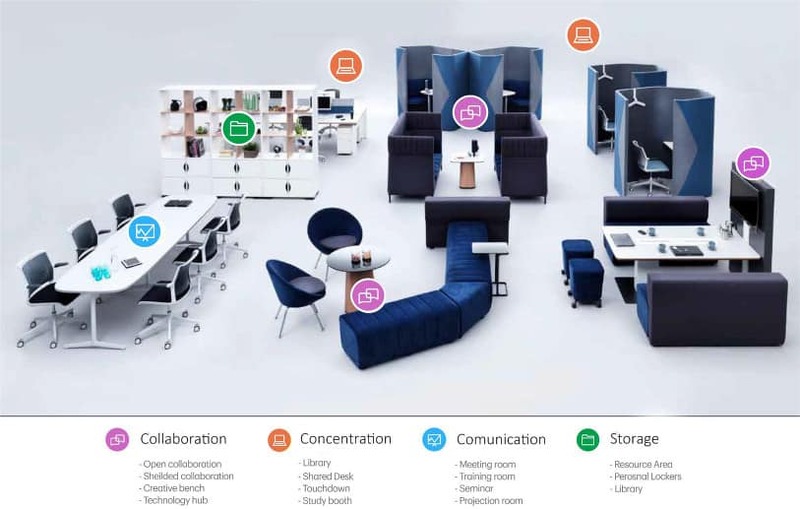 The key element however to making all those spaces work as one overarching office environment is well integrated and reliable technology that supports mobility and interactivity. Most job applicants are shying away from companies that are conventional “cubiclevilles.” They are perceived as the working man’s prison cells. Talented job applicants that you want are seeking to work with more unconventional companies that have a culture conducive to flexibility, collaboration, idea-spawning and the betterment of the environment. Keep in mind that the most productive employees are those that are happy and comfortable. They are the ones who enjoy their work, enjoy their workplace and enjoy getting the results their employers need.